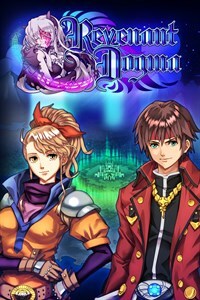 Games like this are becoming more and more rare on Xbox One, so I was pleasantly surprised to see that KEMCO was releasing Revenant Dogma on our Xbox console. This turn-based RPG that seems to come straight out of the 90’s was previously released on iOS and Android, we already have some really excellent games from those platforms so that didn’t make me less curious. So did I enjoy Revenant Dogma, find out in this review! Humans vs. Therians: The story about the humans and the Therians (they look like Mufasa from The Lion King) is intriguing. I was really curious how the story was going to end, that was a big enough motivation for finishing the game, despite some obvious negative parts. While the story becomes a little predictable it did let me create likable feelings towards the main characters. Soundtrack: Gosh I love old-school music from games, Revenant Dogma has some fantastic songs in its collection. While the high-pitched songs aren’t for everyone it is a real blast from the past while playing the game. A lot of unvoiced dialogue: Revenant Dogma has a large amount of interesting dialogue, full with racist human vs therians jokes or character building history. I’m a big fan for games that don’t shy away from large texts but the combination of the absence of voice actors and the flat visual environments made it a little hard to keep the attention span up. Random encounters: You either love or hate random encounters, I personally don’t mind it but I do think they happen a little bit much. Considering I love to explore in levels it is annoying that a new enemy pops up regularly. If the combat was decent I wouldn’t have mind it that much but as you can read later in What is bad the combat isn’t amusing. Sluggish combat: When a developer writes this on the game page from Revenant Dogma “Have a 3D battle experience full of ambience” and “stunning turn-based 3D battles” you would expect some, I don’t know.. fun to play battles? You have transformations and you have to keep an eye on your gauge meter for special attacks but the combat remains a case of I keep using the same attacks (or auto-play) for hours. Because of the random encounters you start to resent when a new enemy pops up, most of the times because you can finish them in one hit.. the lack of any sort of challenge and variation really hurts the gameplay-factor from Revenant Dogma. Visuals: Don’t shoot me please I know EXE-Create and KEMCO are going for that nostalgic retro feeling but that is no excuse to have astonishing boring environments that get repeated a million times over. Character models while in dialogue is the only time the game manages to be good with visuals, everything else is rather bad. From the combat animations, low poly combat visuals and the continues loop of the same looking dungeons. The game was made to be playable on iOS and Android and you can clearly see that in the overall quality of textures. Revenant Dogma [Score: 58/100] These kind of games are great for the specific fanbase but are a hard sell for the average Xbox gamer. Revenant Dogma’s gameplay is far too easy and becomes rather dull after a few minutes. I do hope that KEMCO published more kind of games like this, they are always welcome.